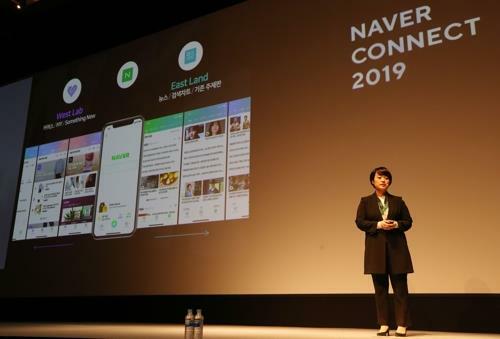 SEOUL, Oct. 10 (Yonhap) -- South Korea's top portal operator, Naver Corp., said Wednesday it will place only its search engine feature on its mobile page. All news headlines, provided by news outlets across the country, will be removed from the first page of the mobile website, according to the overhaul plan announced by CEO Han Seong-sook. This will make its homepage similar to that of Google Inc. The so-called real-time search feature -- which displays the words that are most frequently checked every minute or so -- will also be removed from the first page of Naver's mobile website, Han said. The feature has some negative side effects, as people tend to click on search results that can be manipulated with the right tools. "It has taken a lot of determination to empty the main page," Han said. The move comes amid mounting criticism over the portal's neutrality in the wake of a sprawling online opinion rigging scandal earlier this year. The company has been criticized for having too much editing power. The scandal centers on allegations that a 48-year-old blogger, who goes by the nickname Druking, used a computer program to mastermind illegal online opinion rigging. Druking is suspected of having rigged comments on news articles carried by Naver as they can exert considerable impact on public opinion. Han, however, denied accusations that the overhaul was carried out due to the Druking incident, saying instead that it was a business decision.